Invite kids to join Sparky® as he teaches SAFETY FIRST with a colorful cast of characters. Come join the fun and teach eager young learners about fire safety with America's favorite fire dog! As entertaining as it is educational, children love this Sparky the Fire Dog® story book! Kids can't wait to take off on a fun 'n fantastic dream adventure with superhero Sparky as he leads a group of young animals through the neighborhood checking for fire safety hazards in the home. Youngsters are delighted to discover that the first letter of each animal name spells out SAFETY FIRST -- S for sheep, A for alligator, F for flamingo, and so on. As they fly through their adventure, kids join Sparky and his SAFETY FIRST junior inspector animal friends as they spot fire hazards and deliver big fire safety tips to all the grown-up animals on everything from smoke alarms and space heaters to candles, cooking, grilling, matches and lighters, and even escape plans! Kids, parents, and fire safety officials alike all love the summary of lessons featured at the end of the book. Every page is filled with big, bright, colorful illustrations and vivid story-telling that captivates young ones and holds their attention! Children will read the Sparky the Fire Dog story book over and over again, helping make their lives safer! 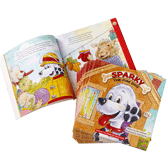 Watch Sparky® talk about the Sparky the Fire Dog® Book!